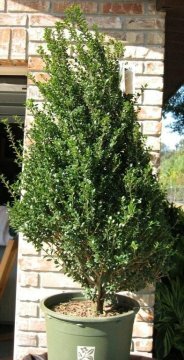 Glossy dark, evergreen foliage with white spring flowers. Excellent for hedges and foundation plantings. 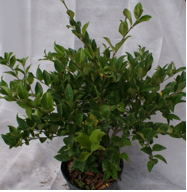 Available as topiaries or multi stemmed small trees. This shrub attracts butterflies. Left un-trimmed Ligustrums will reach 12’ to 15’ at maturity. 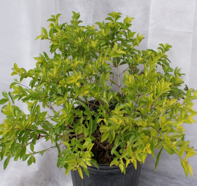 Small, ¼” elliptical green & cream variegated leaves. 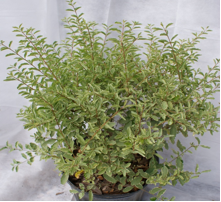 This shrub is good for medium to low hedges and like shearing. Evergreen, and attracts butterflies. Left un-trimmed Sinensis will reach 10’ at maturity. Small, yellow-lime green foliage. 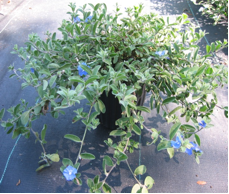 Compact mounding shrub with pale blue flowers spring, summer & fall. Root hardy, attracts butterflies & hummingbirds. Left un-trimmed, Duranta will reach 3’ to 4’ at maturity. Bright green needle like foliage has a weeping and pendulous growth habit. Covered in constant bright red tubular flowers spring & fall. Attracts butterflies & hummingbirds. 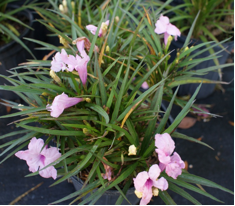 Multi branched ground cover producing 1.5” flowers in purple, pink or white. Great for low borders or massing. Attracts butterflies. Constant bloomer, covered in blue flowers that attract butterflies. 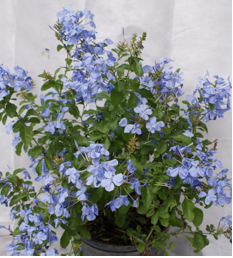 Plumbago will die back in frost/freeze season, Simply cut to ground in spring and enjoy new growth. 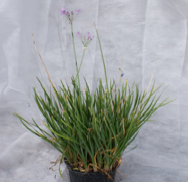 Reaching 4’ tall at maturity, this plant can be pruned and maintained at 2’ to 3’. Iris like foliage with vertical variegation of white & green with small light white to light blue flowers on stems followed by blueberries. A 12” tall spreading ground cover. Small, vibrant, blue flowers bloom spring, summer and fall. 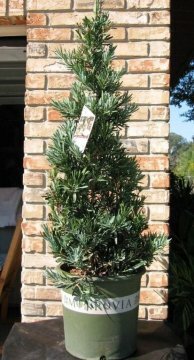 12” – 15” Tall with thin strappy foliage. Purple blooms spring, summer and fall. Large 24” stalks smell of garlic. 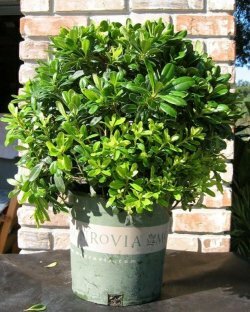 An evergreen shrub in pyramidal form. Dark green foliage with insignificant blooms in the spring. Can grow 6 to 8 ft. tall and 5 to 6 ft. wide. minus 20 to minus 10 degrees F. Full sun. Water regularly when top 3 inches of soil is dry. 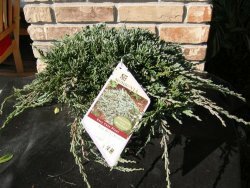 Evergreen shrub for small hedges. Maintain present size and topiary form with pruning. Very hardy minus 20 to minus 10 degrees F. Full to partial sun. Water regularly when top 3 inches of soil is dry. A podocarpus with blue foliage! A slow growing pyramidal lawn or screen tree.Can reach 15 to 25 ft. tall by 15 to 25 ft. wide. 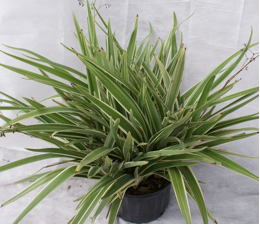 20 to 30 degrees F. Thrives in full sun or shade. Water regularly when top 3 inches of soil is dry. A narrow columnar form of bright golden yellow color. Evergreen can be used for screen, windbreak or large hedge. Slow growing to 15-20 ft. tall & 2-3 ft. wide. 0 to 10 degrees F. Occasional water. Full sun. 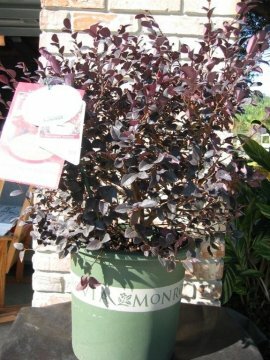 A limited edition palnt with dark burgundy foliage with deep RED flowers. An evergreen compact shrub for high contrast in beds & borders. Moderate growth to 6 ft. tall & wide. 0-10 degrees F. Full to partial sun. Water regularly when top 3 inches of soil is dry. 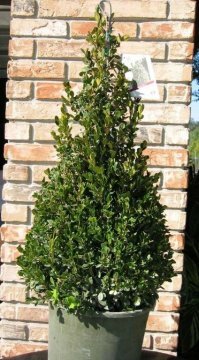 Low border rounded evergreen shrub with compact growth & glossy leaves. Grows 2 to 3 ft. high & 4-5 ft. wide. 20 to 30 degrees F. Full to partial sun. Water regularly when top 3 inches of soil is dry. 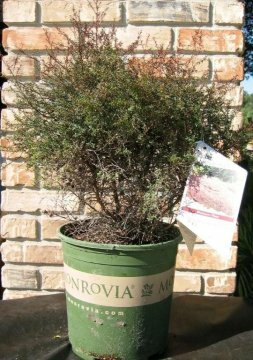 A very dwarf evergreen shrub with tiny dark green foliage. Deep pink flowers in spring. Moderate growth to 2 ft. high & 2 ft. wide. 20-30 degrees F. Needs full sun and occasional water. An evergreen ground cover of silver-blue color. Moderate growth to only 4 inches high, but could spread to 8 ft. without pruning. Very cold hardy to 30-40 degrees F. Full sun, occasional water.